First, preheat your oven to 350 degrees Fahrenheit. Drizzle the strawberries with honey & bake for 15-20 minutes until the strawberries are soft. Let cool for 10-15 minutes or until room temperature. Once cool pour the honey roasted strawberries (juice & all) into a food processor, pulse blend a few times to create a slightly chunky strawberry mixture, & set to the side for later use. In a chilled medium bowl*(2) combine the 1 & 1/2 cups heavy whipping cream, 3 tablespoons of sugar, & 3/4 teaspoon pure vanilla extract & whisk on the highest speed for 1 minute, or until stiff peeks form. 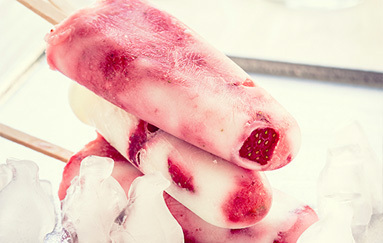 Freeze for 30 minutes, add popsicle sticks, & then continue freezing for 3-4 hours until the Strawberries & Cream Popsicles are completely frozen. *1. I recommend you use a rimmed baking sheet so that the strawberry juice does not spill over into your oven. *2. I placed my bowl in the freezer before beginning this recipe so that it is really cold by the time I get to this step. *3. Be sure to gently drop/shake the popsicle molds on your counter to prevent air bubbles. *4. A quick & easy way to remove the Strawberries & Cream Popsicles is by running the popsicle mold under warm water for a few seconds.